Most snakebites are innocuous and are delivered by nonpoisonous species. North America is home to 25 species of poisonous snakes. Worldwide, only about 15% of the more than 3000 species of snakes are considered dangerous to humans. The family Viperidae is the largest family of venomous snakes, and members can be found in Africa, Europe, Asia, and the Americas. The family Elapidae is the next largest family of venomous snakes. In North America, the venomous species are members of the families Elapidae and Viperidae, subfamily Crotalidae. The subfamily Crotalidae (pit vipers) includes rattlesnakes (Crotalus and Sistrurus), cottonmouths (Agkistrodon), and copperheads (Agkistrodon). 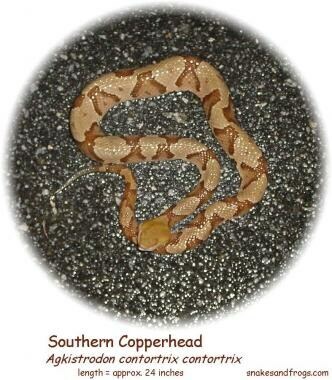 A Southern copperhead is shown in the image below. The Western diamondback (shown in the image below), timber, and prairie rattlesnakes are pit vipers. A triangular-shaped head, nostril pits (heat-sensing organs), elliptical pupils, and subcaudal plates arranged in a single row are characteristic features of Crotalidae. They may be found in all regions of the country, and their habitat varies by species. Cottonmouths reside near swamps or rivers. Copperheads are found in aquatic and dry environments, and rattlesnakes prefer dry grasslands and rocky hillsides. 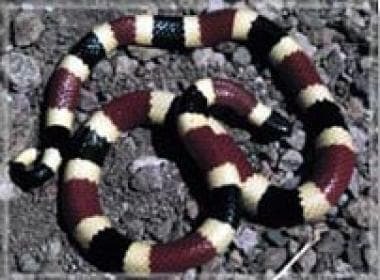 Elapidae includes the coral snakes (Micrurus fulvius fulvius and Micrurus fulvius tenere; this is shown in the image below). The eastern and western species that inhabit the United States are smaller and brightly colored with red, yellow, and black rings. The nonvenomous king snakes share the same colors but not in the same order. A common mnemonic to recall the order of bands is "red on yellow, kill a fellow; red on black, venom lack." These snakes are shown in the image below. Snakebite. Comparison of the harmless Lampropeltis triangulum annulata (Mexican milksnake) (top) with Micrurus tener (Texas coral snake) (bottom). Photo by Charles Alfaro. Coral snake pupils are round, and their subcaudal scales are arranged in double rows. The southern and southwestern states provide the dry, sandy conditions (and often a body of water) that coral snakes prefer. Cobras, mambas, and kraits are also members of the family Elapidae but are not indigenous to the Americas. However, an increasing number of exotic species are kept by both zoos and private collectors, making bites by nonindigenous species increasingly common. Crotalid venom is produced and stored in paired glands below the eye. It is discharged from hollow fangs located in the upper jaw. Fangs can grow to 20 mm in large rattlesnakes. Venom dosage per bite depends on the elapsed time since the last bite, the degree of threat perceived by the snake, and size of the prey. Nostril pits respond to the heat emission of the prey, which may enable the snake to vary the amount of venom delivered. Coral snakes have shorter fangs and a smaller mouth. This allows them less opportunity for envenomation than the crotalids, and their bites more closely resemble chewing rather than the strike for which the pit vipers are famous. Both methods inject venom into the victim to immobilize it quickly and begin digestion. Evidence suggests that the differences between the venom components of different snake species resulted from a diet/prey directed evolution occurring over time. Venom is mostly water. Enzymatic proteins in venom impart its destructive properties. Proteases, collagenase, and arginine ester hydrolase have been identified in pit viper venom. Neurotoxins comprise the majority of coral snake venom. Specific details are known for several enzymes as follows: (1) hyaluronidase allows rapid spread of venom through subcutaneous tissues by disrupting mucopolysaccharides; (2) phospholipase A2 plays a major role in hemolysis secondary to the esterolytic effect on red cell membranes and promotes muscle necrosis; and (3) thrombogenic enzymes promote the formation of a weak fibrin clot, which, in turn, activates plasmin and results in a consumptive coagulopathy and its hemorrhagic consequences. Enzyme concentrations vary among species, thereby causing dissimilar envenomations. Copperhead bites generally are limited to local tissue destruction. 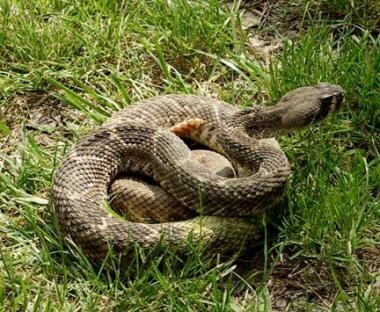 Rattlesnakes can leave impressive wounds and cause systemic toxicity. 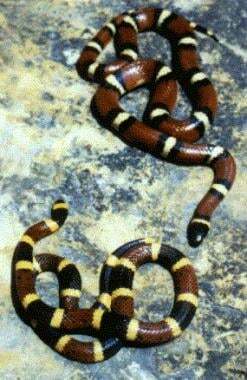 Coral snakes may leave a small wound that later results in respiratory failure from systemic neuromuscular blockade. The local effects of venom serve as a reminder of the potential for systemic disruption of organ system function. One effect is local bleeding; coagulopathy is not uncommon with severe envenomation. Another effect, local edema, increases capillary leak and interstitial fluid in the lungs. Pulmonary mechanics may be altered significantly. The final effect, local cell death, increases lactic acid concentration secondary to changes in volume status and requires increased minute ventilation. The effects of neuromuscular blockade result in poor diaphragmatic excursion. Cardiac failure can result from hypotension and acidosis. Myonecrosis raises concerns about myoglobinuria and renal damage. In the United States, more than 40% of victims put themselves in danger by either handling pets or attempting to capture reptiles in the wild. The popularity of keeping exotic species has increased the number of envenomations by nonnative species. UTMCK data support this by reporting that 15 of 25 patients were bitten handling snakes; 2 of these were involved in religious ceremonies. White males account for 76% of the victims. National studies report a 9:1 male-to-female ratio. University of Tennessee Medical Center at Knoxville (UTMCK) studies report a 2.1:1 male-to-female ratio. National studies report 50% of patients were aged 18-28 years. UTMCK studies report 25% were aged 18-28 years, with a mean of 29.5 years. National studies report 95% of bites were located on an extremity, especially the hand. UTMCK studies report 96% of bites were located on an extremity, of which 56% were to the hand. National studies report a seasonal occurrence of 90% from April to October. UTMCK studies report 100% occurrence from April to October (May: 1 bite out of 25 cases; June to August: 19 bites out of 25 cases; and September to October: 5 bites out of 25 cases). Full recovery is the rule, though local complications from envenomation may occur. Death occurs in less than 1 bite in 5000. A 20-year review of data from the National Vital Statistics Systems identified 97 fatalities. The state of Texas had the most fatalities (17), followed by Florida (14), and Georgia (12). Deaths secondary to snakebites are rare. With the proper use of antivenin, they are becoming rarer still. The national average has been less than 4 deaths per year for the last several years. Local tissue destruction rarely contributes to long-term morbidity. Occasionally, skin grafting is required to close a defect from fasciotomy, but wounds requiring fasciotomy to reduce compartment pressures from muscle edema are infrequent. Data gathered in a 5-year retrospective chart review from the University of Tennessee Medical Center at Knoxville (UTMCK), a level-I trauma center, focused on 25 bites. Of these, 4 required fasciotomy and 2 subsequently needed split-thickness skin grafting. The average length of stay was 3.2 days. No deaths occurred, and morbidity was limited to the local wounds. A new web site (Australian Venom Research Unit) based at the University of Melbourne in Australia comprehensively outlines the species, first aid, and treatment of all venomous creatures indigenous to the region. The web site is easily navigated and sectionally divided for the practitioner, interested epidemiologists, snake fanciers, and children of Australia and the Asia/Pacific region. Barlow A, Pook CE, Harrison RA, Wüster W. Coevolution of diet and prey-specific venom activity supports the role of selection in snake venom evolution. Proc Biol Sci. 2009 Jul 7. 276(1666):2443-9. [Medline]. Johnson CA. Management of snakebite. Am Fam Physician. 1991 Jul. 44 (1):174-80. [Medline]. Kasturiratne A, Wickremasinghe AR, de Silva N, Gunawardena NK, Pathmeswaran A, Premaratna R, et al. The global burden of snakebite: a literature analysis and modelling based on regional estimates of envenoming and deaths. PLoS Med. 2008 Nov 4. 5 (11):e218. [Medline]. Alirol E, Sharma SK, Bawaskar HS, Kuch U, Chappuis F. Snake bite in South Asia: a review. PLoS Negl Trop Dis. 2010 Jan 26. 4 (1):e603. [Medline]. Vaiyapuri S, Vaiyapuri R, Ashokan R, Ramasamy K, Nattamaisundar K, Jeyaraj A, et al. Snakebite and its socio-economic impact on the rural population of Tamil Nadu, India. PLoS One. 2013. 8 (11):e80090. [Medline]. Sotelo N. Review of treatment and complications in 79 children with rattlesnake bite. Clin Pediatr (Phila). 2008 Jun. 47(5):483-9. [Medline]. Weinstein S, Dart R, Staples A, White J. Envenomations: an overview of clinical toxinology for the primary care physician. Am Fam Physician. 2009 Oct 15. 80(8):793-802. [Medline]. Spiller HA, Bosse GM. Prospective study of morbidity associated with snakebite envenomation. J Toxicol Clin Toxicol. 2003. 41(2):125-30. [Medline]. Scharman EJ, Noffsinger VD. Copperhead snakebites: clinical severity of local effects. Ann Emerg Med. 2001 Jul. 38(1):55-61. [Medline]. Gold BS, Dart RC, Barish RA. Bites of venomous snakes. N Engl J Med. 2002 Aug 1. 347 (5):347-56. [Medline]. Darracq MA, Cantrell FL, Klauk B, Thornton SL. A chance to cut is not always a chance to cure- fasciotomy in the treatment of rattlesnake envenomation: A retrospective poison center study. Toxicon. 2015 Jul. 101:23-6. [Medline]. Cumpston KL. Is there a role for fasciotomy in Crotalinae envenomations in North America?. Clin Toxicol (Phila). 2011 Jun. 49 (5):351-65. [Medline]. Bush SP, Ruha AM, Seifert SA, Morgan DL, Lewis BJ, Arnold TC, et al. Comparison of F(ab')2 versus Fab antivenom for pit viper envenomation: a prospective, blinded, multicenter, randomized clinical trial. Clin Toxicol (Phila). 2015 Jan. 53 (1):37-45. [Medline]. Corneille MG, Larson S, Stewart RM, et al. A large single-center experience with treatment of patients with crotalid envenomations: outcomes with and evolution of antivenin therapy. Am J Surg. 2006 Dec. 192(6):848-52. [Medline]. Dart RC, Seifert SA, Boyer LV, et al. A randomized multicenter trial of crotalinae polyvalent immune Fab (ovine) antivenom for the treatment for crotaline snakebite in the United States. Arch Intern Med. 2001 Sep 10. 161(16):2030-6. [Medline]. Lavonas EJ, Gerardo CJ, O'Malley G, et al. Initial experience with Crotalidae polyvalent immune Fab (ovine) antivenom in the treatment of copperhead snakebite. Ann Emerg Med. 2004 Feb. 43(2):200-6. [Medline]. Vohra R, Cantrell FL, Williams SR. Fasciculations after rattlesnake envenomations: a retrospective statewide poison control system study. Clin Toxicol (Phila). 2008 Feb. 46(2):117-21. [Medline]. Richardson WH, Goto CS, Gutglass DJ, Williams SR, Clark RF. Rattlesnake envenomation with neurotoxicity refractory to treatment with crotaline Fab antivenom. Clin Toxicol (Phila). 2007 Jun-Aug. 45(5):472-5. [Medline]. Cannon R, Ruha AM, Kashani J. Acute hypersensitivity reactions associated with administration of crotalidae polyvalent immune Fab antivenom. Ann Emerg Med. 2008 Apr. 51(4):407-11. [Medline]. Snakebite. Copperhead bite day 3; initial wounds to finger. Snakebite. Juvenile southern Pacific rattlesnake (Crotalus oreganus helleri). Photo by Sean Bush, MD. Snakebite. Moderate rattlesnake envenomation in a toddler after treatment with antivenom. Photo by Sean Bush, MD. a PT = Prothrombin time. b PTT = Partial thromboplastin time. a INR = International normalized ratio. b aPTT = Activated partial thromboplastin time.